Tough, rugged, and stylish seat protection from Carhartt! Carhartt SeatSaver Seat Protectors from Covercraft offer the protection you expect form Covercraft paired with the rugged durability of Carhartt. Each seat cover is designed to fit the specific needs of your vehicle, protecting the entire surface unlike inferior “universal” fit products. With super-strong stitching and world-renowned duck-weave fabrics, the Carhartt SeatSaver Seat Protectors are designed to take a beating, and to look good doing it! 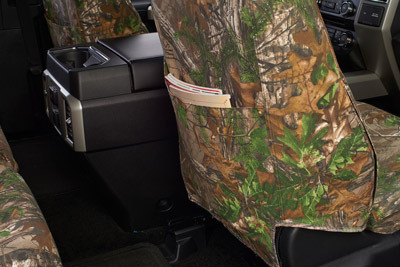 Carhartt Seat Covers are custom designed to properly fit your vehicle. Even if your truck has a center console, armrest, or cupholders, Carhartt Seat Covers provide the perfect fit and protection. Whether you’re shielding your vehicle from dog hair, messy kids, or construction residue, Carhartt SeatSaver Seat Protectors will provide the protection you need to save the like-new look of your interior. Carhartt’s famous duck weave material is strong enough to endure the worst abuse that you can throw at these seat covers! The Durable Water Repellency (DWR) finish helps repel spills, and the machine-washable, easy-to-install, easy-to-remove design makes it a breeze to keep Carhartt SeatSaver Seat Protectors clean. 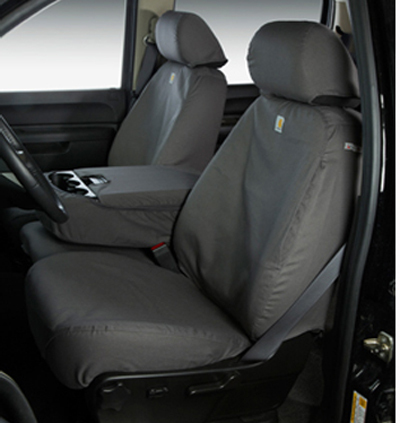 Carhartt SeatSaver Seat Protectors feature overlapped double and triple stitched seams for unmatched durability. Since these are custom made to fit your vehicle, Carhartt SeatSaver Seat Protectors completely cover your headrests and allow you to fold down your seats and use the seatbelts. They even include center console covers so after hitting the gym or leaving the jobsite, your elbows won’t leave damaging body oils on the console’s lid. Carhartt SeatSaver Seat Protectors will protect your seats from damaging UV rays, dirt, and grime with the rugged good looks that suit your lifestyle.